Hi everyone! For those of you keeping score at home, there will be an Unblogged Files post for July coming up within the week, but because my last post: "3 Days in Paris..." was so long, I thought I'd break things up a bit with a short(ish) recipe post. Enjoy! So, earlier this week, I wanted a warm, comforting dinner, but I was too cold and too lazy to leave the house. 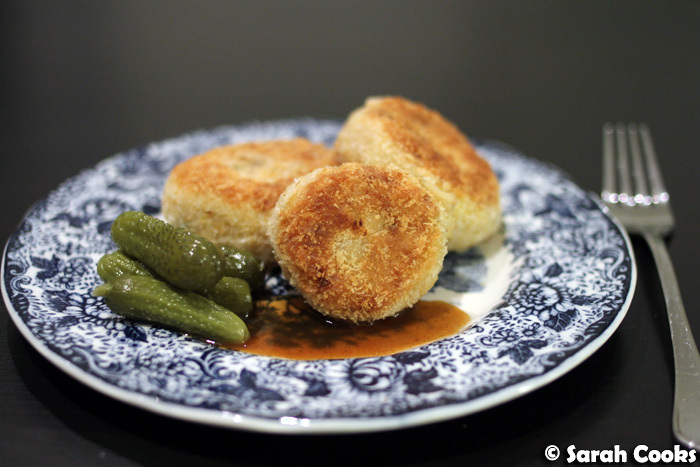 Rummaging through the fridge, I realised I had a bowl of leftover mashed potato - so I made fishcakes! 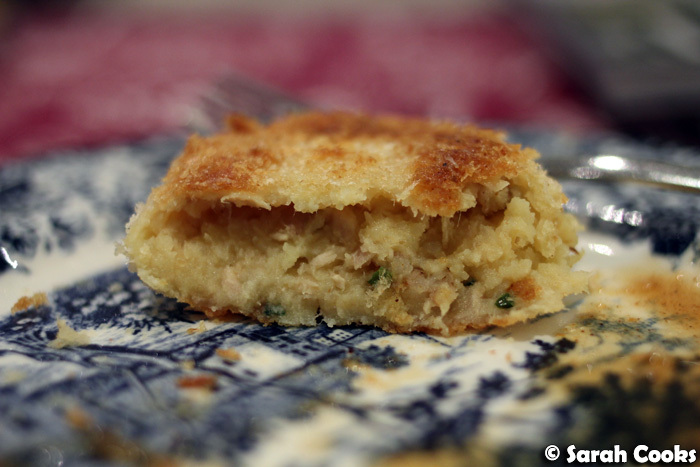 I hadn't made fishcakes since the Sarah Discovers How to Eat days, but remember loving them. Being both crisp and fluffy, and with a good amount of grated cheese, they're everything I want in carb-based comfort food. In addition to the requisite mashed potato and tinned tuna, I added chives, cayenne pepper, and some grated cheddar cheese. I know there's an Italian culinary rule about not mixing seafood and cheese, but when it comes to these old fashioned British comfort dishes (think: fishcakes, fish pie...), the addition of cheese is so perfect! From experience, I know that you can crumb these and freeze them for a future date. When you do want to eat them, you just fry them, unthawed, until golden brown on each side, then sit them in the oven at 120C for at least twenty minutes and up to an hour, by which time they'll be heated through. I was hungry, however, and fried them all at once. Argh! They were so good - just perfect for the cold weather, stodgy enough to be comforting, but not so heavy that you'll fall asleep afterwards. Obviously they're best eaten as soon as they're cooked, but I actually microwaved the leftovers at work the next day and they were still decent. I think some boiled peas would be a good accompaniment, but as I didn't have on hand, I just ate them with a few pickles and some extra-hot curry ketchup. Preheat the oven to low (75C or as low as it will go). Line a baking tray with kitchen paper and place in the oven. 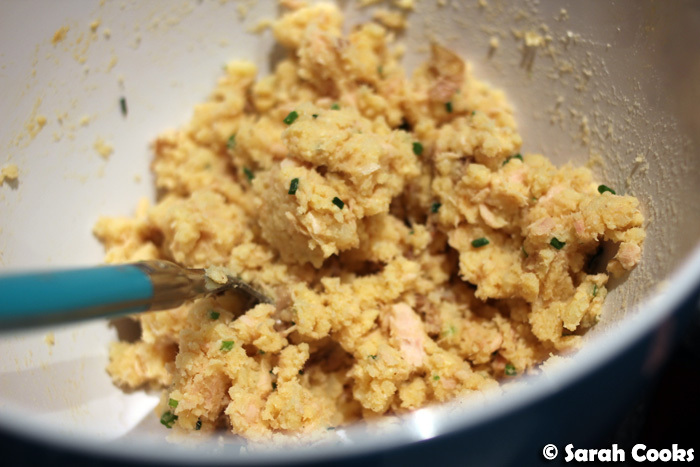 Mix together the mashed potato, tuna, cheese, chives and cayenne pepper. Season with salt and pepper and mix to combine. Shake some flour into a shallow dish. Break the egg into another shallow dish and whisk lightly. Place the breadcrumbs in a shallow dish. Take large spoonfuls of the potato mixture and roll into patties. 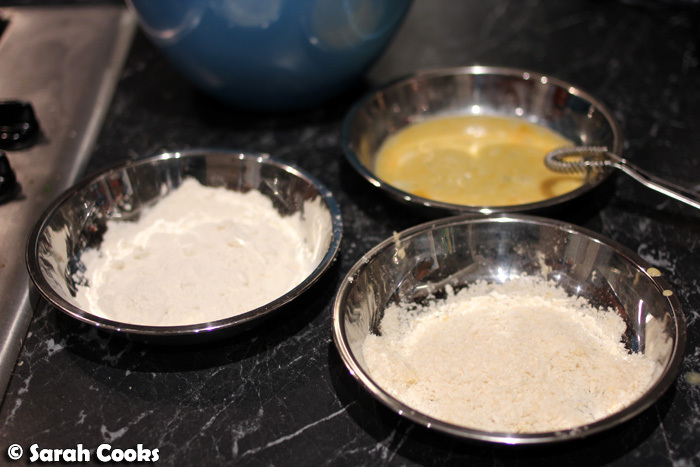 Dip into the flour, followed by the egg, and the breadcrumbs. Heat the vegetable oil in a non-stick frypan over a medium heat. Fry the patties for 3-5 minutes on each side, until golden brown and heated through. 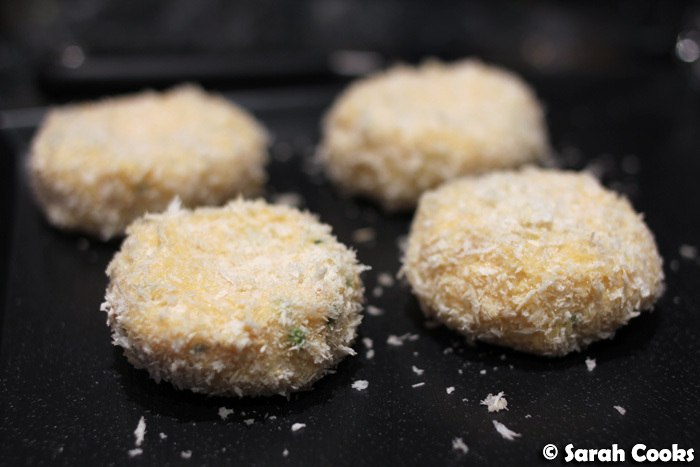 Remove the fishcakes to the baking tray in the oven as you go to keep them warm. Serve with cornichons and ketchup. I've never been a huge fan of tuna fishcakes but yours look so awesome I'm considering giving these another go. lol. Nice recipe. Thank's for sharing. Everything I fully expected of these tools. Great review!